Apparently, some people have been freaking out due to the ongoing drop of Tether’s market dominance. 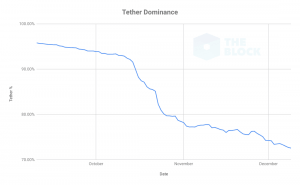 Since the summer, Tether’s dominance as the number one stablecoin has been weakening, and there is a high degree of speculation regarding whether or not it’s fully backed by real USD or not. Of course, these cries for attention really fall short when we actually look at the data. Just by looking at the trading volume we can see, at least at the time of writing, there’s no reason to worry about Tether being replaced. It’s still the most trusted stablecoin out there, even in spite of everything that has happened and the emotional roller coaster holders had to endure – after all, Tether was trading about 10-15% cheaper a month back. Yet, Tether is still the number one stablecoin out there. For the time being, it accounts for 95% of the stablecoin trading volume. The extent of Tether’s dominance is visualised in the following chart, so you can have a visual perspective of how relaxed you can be. Volume wise, there’s not much to say as well. As I said, data speaks for itself. 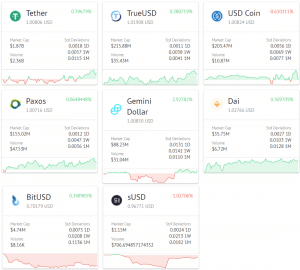 Tether is the most liquid and easy-to-exchange stablecoin and is present at most exchanges out there, so why would cryptocurrency users change now? It seems the worst bit of the storm has passed, and the company can now focus on building a proper business, listening to users’ concerns, and paving the way towards a more transparent future (where audits are a regular thing). Let’s just hope someone at Bitfinex is reading this.